Danville celebrated its 11th state title, its first since 2003, after beating Mayfield 35-21 in the Class 2A finals Saturday afternoon at Kroger Field. 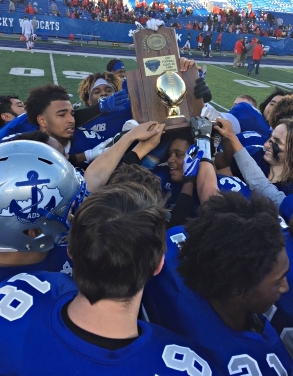 Winning football is a family tradition spanning generations at Danville High School, and the Admirals’ family is celebrating another championship today. Danville won its 11th state title by beating familiar foe Mayfield 35-21 in the Class 2A finals Saturday afternoon in front of 7,398 fans at Kroger Field. David Walker eyed the championship trophy after Danville’s win over Mayfield Saturday afternoon. Thirty years ago, the Admirals beat Mayfield 24-23 in overtime in the 2A title game. David Walker was one of Danville’s heroes, scoring a TD in the extra period, then blocking Mayfield’s extra-point kick to seal that victory. Saturday afternoon, David Walker’s son, also named David, helped the Admirals beat Mayfield in the finals again. He was Danville’s second-leading receiver and second-leading tackler in helping secure the school’s first state title since 2003. Don Harris knew what Walker was talking about. Don’s dad, also named Don, was part of Danville’s 1987 title team, too. Don Harris bit the championship hardware after Saturday’s victory. Saturday afternoon, Harris led the Admirals in tackles and was their second-leading rusher. He was almost too giddy to talk as he clutched the championship trophy amid the post-game celebration. Danville quarterback Zach Thornton, who threw for 118 yards and 2 TDs, and rushed for 64 yards, also has a tie to past glory. His dad Michael was on the Admirals’ 1992 title team. And so does lineman Ryan Jackson. His father Chris was also part of Danville’s ’87 champs. Coach Clay Clevenger appreciates his program’s rich tradition. He was an all-state lineman on the Admirals’ 1994 state title team coached by Sam Harp. When Harp stepped down after 25 years (and six state championships) in 2013, Clevenger left Henderson County to return to his alma mater. Danville Coach Clay Clevenger hugged one of his sons after Saturday’s victory. “You don’t come to Danville to go 8-4,” Clevenger said. “We came to Danville to try to win a state championship. And to earn another state title for Danville, to go with the ones won by Harp, Tom Duffy (1984, ’87) and Ray Callahan (1962), resonates with Clevenger. Part of that tradition is beating Mayfield in the state finals. Danville is now 5-0 against the Cardinals in championship games (1987, 1989, 1991, 1992, 2017). The Admirals biggest playmaker Saturday was senior D’Mauriae VanCleave. He rushed for 103 yards and 2 TDs, caught 5 passes for 42 yards and a TD, and returned a punt 60 yards for a score. Who knows? Thirty years from now D’Mauriae might have a son helping Danville win another state title. After all, winning championships is a family tradition with the Admirals.